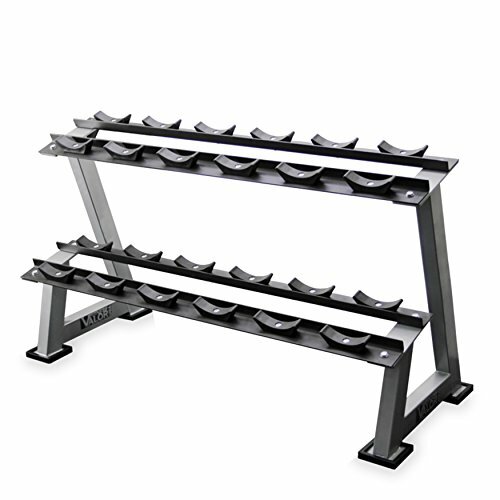 The Valor Fitness BG-10 Dumbbell Rack (Weights Sold Separately) holds 6 pairs of your favorite pro-style dumbbells or 8 to 9 pair of your favorite hex dumbbells. Heavy-Duty Rubber cups allow for a firm and strong grip on your pro style dumbbells OR the holders can be removed for use with a set of hex style dumbbells. Built with club-quality materials, this rack will be around as long as you need someone/something to hold your dumbbells. Recommended Max weight 500lbs. Recommended max weight 500 lbs.